It’s National Pet Month, and while the health benefits of pets have been long established, we would like to take a few minutes to recognize the importance of companion pets in assisted living and how TRULY beneficial it is. In addition to all the well-known health benefits that pets provide to all of us (lowered blood pressure, lower stress levels, lower cholesterol, etc.) pets can also provide companionship and a sense of purpose at a time of life that can often be lonely. Pets provide unconditional love, companionship, and nonverbal communication, which, for many seniors, can be just what the doctor ordered. While walking a dog provides good cardiovascular exercise, it can also be a bridge to socializing with others. A dog isn’t just man’s best friend, he can also be man’s best wingman. 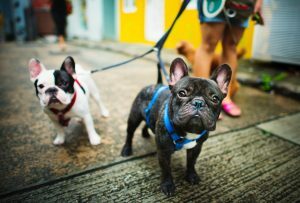 Try walking a friendly, good-looking dog in any well-populated area and you’ll have people wanting to pet your dog and other dogs wanting to introduce themselves to your dog. It’s a great icebreaker for talking to other people in your community, especially other dog owners, and can help alleviate some of the feelings of isolation that come with getting older. 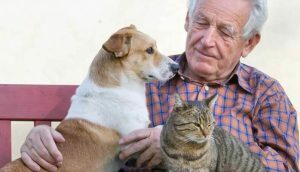 Assisted living facilities that allow animals have noticed how beneficial they can be with new residents, who are often especially withdrawn and uncommunicative. Sometimes a resident’s first significant interaction in the facility is with an animal, and that opens a pathway to talking with other residents and staff. Taking care of a pet can also provide seniors with a sense of worth and boost their self-esteem. At a time when many people start to feel like they’re no longer contributing anything to the world, a pet can help reduce those feelings by assuring seniors they are needed and loved. Pet therapy has also been proven to be especially useful in helping seniors deal with “Sundowner’s Syndrome,” a condition in which those with Alzheimer’s suffer periods of increased confusion and agitation in the evenings. Animals can help soothe patients during these tough times with their non-verbal communication and unconditional acceptance of the patients. For some seniors, it can even serve as a reminder of a pet they had when they were growing up, which can help to calm them. As vital as pets can be to those living in assisted living facilities, buildings that allow their residents to have pets need to be careful that the needs of both the patient and the pet are being met. If the patient is forgetful and doesn’t always remember to feed or walk their pet, they may need help from the assisted living facility staff. After all, seniors tend to move to an assisted living facility because they need help with certain day-to-day tasks of living and taking care of themselves. While the fact that they need help taking care of themselves does not necessarily mean they can’t take care of an animal, it might mean it would be a good idea for the staff to keep an eye on the animal and make sure they are not being neglected. In order to avoid this problem, some assisted living facilities might choose to keep pets in the building that are in the charge of the staff, but that are available to spend time with all residents. 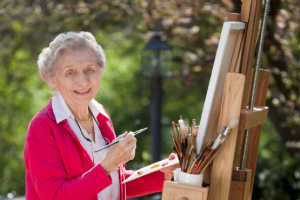 Hobbies are a great way for retired citizens to stay active, both physically and mentally and the importance of having a hobby in our golden years is backed up by an increasing body of evidence. If you or a loved one are considering what to do with your retirement years, here are 10 healthy hobbies seniors can start/develop. One of the most detrimental effects of retirement is it tends to make people feel like they are no longer useful. It often leads to them feeling cut off from society, which in turn leads to depression and a variety of health issues. Volunteering can combat those feelings by giving seniors a purpose again and a way to become active in the community. We’re all told to exercise and maintain physical activity throughout our lives and it’s even more important to continue doing so as we age. From walking to yoga there’s something for everyone, including those whose mobility is limited as they get older. Swimming is especially popular among seniors who often suffer from joint pain as a result of lost cartilage. Many studies have been done on the health benefits of gardening. To start with, it gets you outside and moving, both things that are known to boost mood, immune system function, and overall health. You can make it an even healthier activity by growing some of your favorite fruits and vegetables. Whether singing, dancing, playing a musical instrument, or all three, music is a great way to keep minds and bodies feeling young. It’s enjoyable, provides mental and physical stimulation, and can be done with a partner or in a group for an added social aspect. Psychologists have long known about the long-term health benefits of things like crossword puzzles and that continues to be true for all mentally challenging games. People of all ages who play games like Scrabble and chess exhibit enhanced cognitive function. There’s nothing like creating something with your own hands. Arts and crafts can keep seniors active, maintain/improve their coordination, and provide a creative outlet for their thoughts and feelings. They say you learn something new everyday and that should remain true right up until the end. If you’ve always wondered how to identify birds or poisonous plants, your retirement years just might be the perfect time to find the answers to all those questions that have been plaguing you your whole life – or the last five minutes. If you’ve always wanted to try making your own beer or wine, there’s no time like the present. Writing is another form of expression and a great option for people of any age. Whether you want to use your retirement years to put together that novel you’ve always wanted to write, or just short stories for your own amusement, creative writing has proven benefits for cognitive and emotional health. There’s nothing like have a living, sentient being literally depend on you for survival to make you feel needed and useful. It’s also a symbiotic relationship because having a pet is known to improve mood and immune function while reducing stress and blood pressure. The need to stay active is so important in the life of a senior. There are many options for seniors to stay active. Here at Stillwater Senior Living, our staff can provide stimulating activities to keep our seniors engaged and occupied. CONTACT US TODAY to find out ore and take a tour of our beautiful state-of-the-art community. Our pets: Rowdy, Cinder, Gizmo, Shadow, Misty, Jack, Petey, Angel, Peyton, Jersey, Jovi, Chelsey, Carley and Hunter. They are part of our family you probably haven’t met yet. They are our pets. Our pets’ monikers stem from their color, size, personality, a nod to a sports icon, or simply an endearing term. Their unconditional love and companionship coupled with their roles as a willing exercise partner, active playmate, household guardian, and trusted confidant, keeper of secrets. Now science has substantiated that having pets reduces our stress, lowers our blood pressure, promote mobility, eases isolation, increases socialization and just makes us… happy! Though dogs are often referred to as “man’s best friend,” but one should substitute the word pets to be most accurate. Recognizing their unique roles in our family and yours, Stillwater is designed as a pet-friendly community/ Each apartment comes with its own outside patio and door, a fenced dog run and even concierge pet services should a resident no longer ably attend to the needs of his/her pet. At Stillwater Senior Living, we are not just pet friendly, we love pets! and are well aware of the many positive physical and emotional benefits that pets provide. That’s why pets are not only permitted in the apartments – hey are most welcomed! We’ve found they help our residents thrive daily. Research suggests that in addition to providing companionship, pets can reduce the risk of heart disease, lower instances of stress, depression, and loneliness in their owners. Our pet friendly landscaping plan includes a dog run designed to allow you and your dog a chance to be outside and enjoy some time off of their leash. We are happy to provide assistance caring for your pet! Our Pet Concierge service is available to help manage those tasks. We can even help you keep up to date on your furry friend’s medical and grooming needs. Just ask us anything about caring for your pet’s needs and we will make sure you get the answers and help you need today.